I'm starting my halloween cards early this year. It seems every year I wait to make cards to send to my nieces and nephews and do them at the last minute. I'm running a little late today so I have to make this short. Have a great Tuesday. Great card, I love Halloween. Cute how all of the faces are different. Love this card! The background paper and accent colors you used are perfect! Love your cute ghost card. Ghosts and pumpkins are my favorite. Love the fencing I'll have to go get that one. Lovely card, Christina! And oh love that seam binding ribbon too - bought me some online (from ebay as you previously suggested) and I'm ready to make my own! Definitely going to give you credit when I post a project with it on my blog (hopefully this week). Thanks for the inspiration! never too early for Halloween. Love the cards, thanks. Boo-rific. Like the MS Iron Fence punch. There's a challenge at Celebrate the Occasion that you can enter this card in since you used ribbon: Celebrate the occasion Ch#32 Any Occasion (must use ribbon). Ck it out. 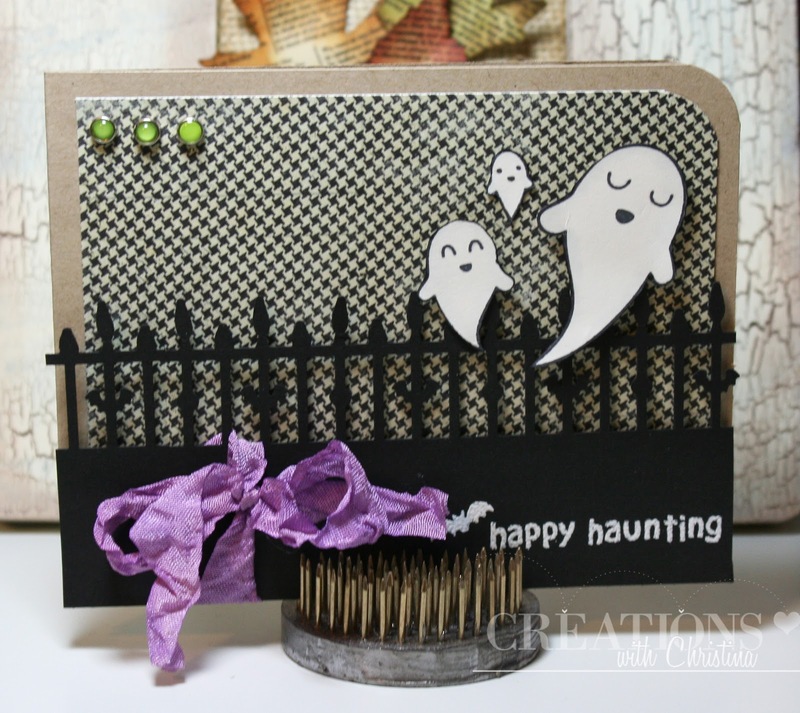 Very cute card, I love those little ghosts! Cute card! The fence punch and purple seem binding just make it so fun! I really like the white embossing on the black card stock too.